Engineered for maximum durability and long life with impact drivers. Forged, so they fit fasteners more precisely, which reduces stripping and increases the life of the bit. Manufactured with heavy-duty, cold-forged, high grade steel to withstand extremely high torque output. Black oxide finish resists corrosion. High quality S2 chrome molybdenum steel. High quality S2 chrome molybdenum steel. High quality S2 chrome molybdenum steel. High quality S2 chrome molybdenum steel. High quality S2 chrome molybdenum steel. High quality S2 chrome molybdenum steel. High quality S2 chrome molybdenum steel; 1/4" hex shank. Used in high torque power tools; for use in power drill chuck and chuck adapter; 1/4" hex shank. Used in high torque power tools; for use in power drill chuck and chuck adapter; 1/4" hex shank. Used in high torque power tools; for use in power drill chuck and chuck adapter; 1/4" hex shank. Specially designed to reduce stripping. Heat treated to resist breakage and wear. Made of shock resistant tool steel for maximum durability. Hardened core for extra strength and reduced breakage. Specially designed to reduce stripping. Heat treated to resist breakage and wear. Made of shock resistant tool steel for maximum durability. Hardened core for extra strength and reduced breakage. Specially designed to reduce stripping. Heat treated to resist breakage and wear. Made of shock resistant tool steel for maximum durability. Hardened core for extra strength and reduced breakage. Specially designed to reduce stripping. Heat treated to resist breakage and wear. Made of shock resistant tool steel for maximum durability. Hardened core for extra strength and reduced breakage. Made of shock resistant tool steel; 1/4" hex shank. Specially designed to reduce stripping. Heat treated to resist breakage and wear. Made of shock resistant tool steel for maximum durability. Hardened core for extra strength and reduced breakage. Made of shock resistant tool steel; 1/4" hex shank. Made of shock resistant tool steel; 1/4" hex shank. Specially designed to reduce stripping. Heat treated to resist breakage and wear. Made of shock resistant tool steel for maximum durability. Hardened core for extra strength and reduced breakage. High performance for metal, wood, deck and drywall applications. Specially designed to reduce stripping. Heat treated to resist breakage and wear. Made of shock resistant tool steel for maximum durability. Hardened core for extra strength and reduced breakage; 1/4" hex shank. Engineered for maximum durability and long life with impact drivers. Forged, so they fit fasteners more precisely, which reduces stripping and increases the life of the bit. Manufactured with heavy-duty, cold-forged, high grade steel to withstand extremely high torque output. Black oxide finish resists corrosion. Engineered for maximum durability and long life with impact drivers. Forged, so they fit fasteners more precisely, which reduces stripping and increases the life of the bit. Manufactured with heavy-duty, cold-forged, high grade steel to withstand extremely high torque output. Black oxide finish resists corrosion. Engineered for maximum durability and long life with impact drivers. Forged, so they fit fasteners more precisely, which reduces stripping and increases the life of the bit. Manufactured with heavy-duty, cold-forged, high grade steel to withstand extremely high torque output. Black oxide finish resists corrosion. S2 tool steel construction with a Rockwell Hardness between 58-62 for strength and precise fit; quick, easy change-out in production use; 1/4" hex shank. 2 per package. Used in high torque power tools; for use in power drill chuck and chuck adapter; 1/4" hex shank. Clutch type G power bit made with S2 tool steel construction with a Rockwell Hardness between 58-62 for strength and precise fit; 1/4" hex shank. Used in high torque power tools; for use in power drill chuck and chuck adapter; 1/4" hex shank. Clutch type G power bit made with S2 tool steel construction with a Rockwell Hardness between 58-62 for strength and precise fit; 1/4" hex shank. High quality S2 chrome molybdenum steel. High quality S2 chrome molybdenum steel. High quality S2 chrome molybdenum steel. Geometric design provides the shock absorption zone. Proprietary steel and heat treat process for maximum strength and durability. Forged tip allows for a secure grip and maximum contact eliminating stripping or slipping. 10X life over standard impact bits. High-visibility sleeve with laser-etched markings for user convenience. Bosch Power Screwdriver Bit, NO 1 Point, Phillips, P1 Point, 2 in Overall Length, Hexagonal Shank, 1/4 in Shank, Steel, Black Oxide, Impact Tough Hardness, For Impact Driver High quality S2 chrome molybdenum steel. Geometric design provides the shock absorption zone. Proprietary steel and heat treat process for maximum strength and durability. Forged tip allows for a secure grip and maximum contact eliminating stripping or slipping. Geometric design provides the shock absorption zone. Proprietary steel and heat treat process for maximum strength and durability. Forged tip allows for a secure grip and maximum contact eliminating stripping or slipping. Engineered for extreme durability. Made from proprietary steel and heat treated to control hardness. Geometric design provides shock absorption zone to extend life. The forged tip allows for a secure grip and maximum contact, eliminating stripping or slipping. Includes: (1) Phillips Shockwave power bit; 1/4'' diameter. Performance-optimized S2 steel construction for extended life. Ideal for driving screws in a variety of heavy duty applications including metal fastening, deck building, framing, and installing plywood subfloor. For use with high torque impact drivers and driver-drills. Includes: (2) ImpactX #2 Phillips bits. Xtended Torsion Zone to absorb high-torque of new impact drivers. Precision engineered for a tighter fit and less cam-out. Heat-treated manufacturing for stronger bit. High visibility sleeve with laser etched markings for user convenience. 2" overall length. 10X life over standard impact bits. High-visibility sleeve with laser-etched markings for user convenience. For impact drills and drivers. Engineered for maximum durability and long life with impact drivers. Fit fasteners more precisely, which reduces stripping. Manufactured with heavy-duty, cold-forged, high grade steel to withstand high torque output. Black oxide finish resists corrosion. Tempered steel for increased durability. Ribbed tip withstands up to 50 percent more torque before camout. Proven sub-zero tempering process gives these bits long life and increased durability. Tempered steel for increased durability. Ribbed tip withstands up to 50 percent more torque before camout. Proven sub-zero tempering process gives these bits long life and increased durability. Tempered steel for increased durability. Ribbed tip withstands up to 50 percent more torque before camout. Proven sub-zero tempering process gives these bits long life and increased durability. Performance-optimized S2 steel construction for extended life. Ideal for driving screws in a variety of heavy duty applications including metal fastening, deck building, framing, and installing plywood subfloor. For use with high torque impact drivers and driver-drills. Includes: (2) ImpactX #2 Phillips bits. Specially designed to reduce stripping. Heat treated to resist breakage and wear. Made of shock resistant tool steel for maximum durability. Hardened core for extra strength and reduced breakage. Clutch type G power bit made with S2 tool steel construction with a Rockwell Hardness between 58-62 for strength and precise fit; 1/4" hex shank. Specially designed to reduce stripping. Heat treated to resist breakage and wear. Made of shock resistant tool steel for maximum durability. Hardened core for extra strength and reduced breakage. Specially designed to reduce stripping. Heat treated to resist breakage and wear. Made of shock resistant tool steel for maximum durability. Hardened core for extra strength and reduced breakage. Made of shock resistant tool steel for maximum durability with hardened core for extra strength and reduced breakage in applications such as metal, wood, deck and drywall; 1/4" hex shank. For impact drills and drivers. Engineered for maximum durability and long life with impact drivers. Fit fasteners more precisely, which reduces stripping. Manufactured with heavy-duty, cold-forged, high grade steel to withstand high torque output. Black oxide finish resists corrosion. For impact drills and drivers. Engineered for maximum durability and long life with impact drivers. Fit fasteners more precisely, which reduces stripping. Manufactured with heavy-duty, cold-forged, high grade steel to withstand high torque output. Black oxide finish resists corrosion. For impact drills and drivers. Engineered for maximum durability and long life with impact drivers. Fit fasteners more precisely, which reduces stripping. Manufactured with heavy-duty, cold-forged, high grade steel to withstand high torque output. Black oxide finish resists corrosion. Industrial deck bit tip that is shock resistant steel for maximum durability, hardened core for extra strength and reduced breakage, heat treated to resist breakage and wear and specially designed to reduce stripping; 1/4" hex shank. Used in high torque power tools; for use in power drill chuck and chuck adapter; 1/4" hex shank. For impact drills and drivers. Engineered for maximum durability and long life with impact drivers. Fit fasteners more precisely, which reduces stripping. Manufactured with heavy-duty, cold-forged, high grade steel to withstand high torque output. Black oxide finish resists corrosion. For impact drills and drivers. Engineered for maximum durability and long life with impact drivers. Fit fasteners more precisely, which reduces stripping. Manufactured with heavy-duty, cold-forged, high grade steel to withstand high torque output. Black oxide finish resists corrosion. For impact drills and drivers. Engineered for maximum durability and long life with impact drivers. Fit fasteners more precisely, which reduces stripping. Manufactured with heavy-duty, cold-forged, high grade steel to withstand high torque output. Black oxide finish resists corrosion. Geometric design provides the shock absorption zone. Proprietary steel and heat treat process for maximum strength and durability. Forged tip allows for a secure grip and maximum contact eliminating stripping or slipping. Engineered for extreme durability. Made from proprietary steel and heat treated to control hardness. Geometric design provides shock absorption zone to extend life. The forged tip allows for a secure grip and maximum contact, eliminating stripping or slipping. Includes: (1) Phillips Shockwave power bit; 1/4'' diameter. Specially designed to reduce stripping. Heat treated to resist breakage and wear. Made of shock resistant tool steel for maximum durability. Hardened core for extra strength and reduced breakage. Engineered to be the more durable and better fitting. The optimized shock zone geometry is unique for each tip type to provide longer life and absorb 3 times more torque. Engineered to be the more durable and better fitting. The optimized shock zone geometry is unique for each tip type to provide longer life and absorb 3 times more torque. Engineered to be the more durable and better fitting. The optimized shock zone geometry is unique for each tip type to provide longer life and absorb 3 times more torque. Engineered to be the more durable and better fitting. The optimized shock zone geometry is unique for each tip type to provide longer life and absorb 3 times more torque. Geometric design provides the shock absorption zone. Proprietary steel and heat treat process for maximum strength and durability. Forged tip allows for a secure grip and maximum contact eliminating stripping or slipping. Made of shock resistant tool steel; 1/4" hex shank. Geometric design provides the shock absorption zone. Proprietary steel and heat treat process for maximum strength and durability. Forged tip allows for a secure grip and maximum contact eliminating stripping or slipping. Bosch Power Screwdriver Bit, NO 2 Point, Phillips, P2 Point, 1 in Overall Length, Hexagonal Shank, 1/4 in Shank, Steel, Black Oxide, Impact Tough Hardness, For Impact Driver Specially designed to reduce stripping. Heat treated to resist breakage and wear. Made of shock resistant tool steel for maximum durability. Hardened core for extra strength and reduced breakage. Impact Ready accessories deliver exceptional performance for extreme torque applications. FlexTorq bits feature an extended FlexTorq zone to transfer optimal torque in hard joint applications, providing durability and longer life. The bit tip is CNC machined for a precise fit. Magnetic Screw Lock sleeve minimizes drops and reduces wobbles. Impact ready bits with flextime have increased durability and long life. Single end. Impact rated. Drive Size: 6. Overall Length: 6". Point Size: No 2. Point Type: Phillips. Shank Size: 1/4". Magnesium Phosphate finish. For impact drills and drivers. Engineered for maximum durability and long life with impact drivers. Fit fasteners more precisely, which reduces stripping. Manufactured with heavy-duty, cold-forged, high grade steel to withstand high torque output. Black oxide finish resists corrosion. For impact drills and drivers. Engineered for maximum durability and long life with impact drivers. Fit fasteners more precisely, which reduces stripping. Manufactured with heavy-duty, cold-forged, high grade steel to withstand high torque output. Black oxide finish resists corrosion. For impact drills and drivers. Engineered for maximum durability and long life with impact drivers. Fit fasteners more precisely, which reduces stripping. Manufactured with heavy-duty, cold-forged, high grade steel to withstand high torque output. Black oxide finish resists corrosion. Shock-resistant tool steel for maximum durability with a hardened core for extra strength and reduced breakage; 1/4" hex shank; 3 pieces. 6'' power bits are engineered for extreme durability and long life. Made from proprietary steel and heat treated to control hardness. The forged tip allows for a secure grip and maximum contact, eliminating stripping or slipping. Ideal for heavy duty impact applications for all drilling and fastening needs. Includes P2 Phillips Shockwave 6'' power bit. Industrial deck bit tip that is shock resistant steel for maximum durability, hardened core for extra strength and reduced breakage, heat treated to resist breakage and wear and specially designed to reduce stripping; 1/4" hex shank. Made of high-grade S2 tool steel and milled for precise fit. Specifically built for the higher torque requirements of power tools; can be used with drill chuck or quick change chuck adapter in applications such as appliance, automotive, aviation, decking, drywall, electronics, furniture assembly, general construction and HVACR; 1/4" hex shank. Made of high-grade S2 tool steel and milled for precise fit. Specifically built for the higher torque requirements of power tools; can be used with drill chuck or quick change chuck adapter in applications such as appliance, automotive, aviation, decking, drywall, electronics, furniture assembly, general construction and HVACR; 1/4" hex shank. DoubleLok technology ensures both ends of bit lock securely in impact drivers and quick-change chucks, enabling use of two tips from one bit for added convenience and extended life. Precision tip geometry delivers superior fitment, reducing stripping and cam-out. Power groove designed for compatibility with Irwin Impact Performance series Magnetic Screw Hold Attachment. Manufactured with Heavy-duty, cold forged high-grade steel to withstand high torque output. T20/T20. 2-3/8" overall length. DoubleLok technology ensures both ends of bit lock securely in impact drivers and quick-change chucks, enabling use of two tips from one bit for added convenience and extended life. Precision tip geometry delivers superior fitment, reducing stripping and cam-out. Power groove designed for compatibility with Irwin Impact Performance series Magnetic Screw Hold Attachment. Manufactured with Heavy-duty, cold forged high-grade steel to withstand high torque output. T20/T25. 2-3/8" overall length. DoubleLok technology ensures both ends of bit lock securely in impact drivers and quick-change chucks, enabling use of two tips from one bit for added convenience and extended life. Precision tip geometry delivers superior fitment, reducing stripping and cam-out. Power groove designed for compatibility with Irwin Impact Performance series Magnetic Screw Hold Attachment. Manufactured with Heavy-duty, cold forged high-grade steel to withstand high torque output. T25/T25. 2-3/8" length. DoubleLok technology ensures both ends of bit lock securely in impact drivers and quick-change chucks, enabling use of two tips from one bit for added convenience and extended life. Precision tip geometry delivers superior fitment, reducing stripping and cam-out. Power groove designed for compatibility with Irwin Impact Performance series Magnetic Screw Hold Attachment. Manufactured with Heavy-duty, cold forged high-grade steel to withstand high torque output. T25/#2PH. 2-3/8" length. DoubleLok technology ensures both ends of bit lock securely in impact drivers and quick-change chucks, enabling use of two tips from one bit for added convenience and extended life. Precision tip geometry delivers superior fitment, reducing stripping and cam-out. Power groove designed for compatibility with Irwin Impact Performance series Magnetic Screw Hold Attachment. Manufactured with Heavy-duty, cold forged high-grade steel to withstand high torque output. T25/#2SQ. 2-3/8" overall length. DoubleLok technology ensures both ends of bit lock securely in impact drivers and quick-change chucks, enabling use of two tips from one bit for added convenience and extended life. Precision tip geometry delivers superior fitment, reducing stripping and cam-out. Power groove designed for compatibility with Irwin Impact Performance series Magnetic Screw Hold Attachment. Manufactured with Heavy-duty, cold forged high-grade steel to withstand high torque output. #2PH. 2-3.8" overall length. Specially designed to reduce stripping. Heat treated to resist breakage and wear. Made of shock resistant tool steel for maximum durability. Hardened core for extra strength and reduced breakage. Geometric design provides the shock absorption zone. Proprietary steel and heat treat process for maximum strength and durability. Forged tip allows for a secure grip and maximum contact eliminating stripping or slipping. Made of shock resistant tool steel; 1/4" hex shank. Made of shock resistant tool steel; 1/4" hex shank. Made of shock resistant tool steel; 1/4" hex shank. Made of shock resistant tool steel for maximum durability with hardened core for extra strength and reduced breakage in applications such as metal, wood, deck and drywall; 1/4" hex shank. Type G type bit that is a popular fastener type used in mobile homes and truck trailers; 1/4" hex shank. Specially designed to reduce stripping. Heat treated to resist breakage and wear. Made of shock resistant tool steel for maximum durability. Hardened core for extra strength and reduced breakage. Replacement bits for use with Quik Drive auto feed screw driving systems. For all drive screws with Phillips recess. #2 Phillips drive bits. Quik Drive, undersized square drive bits and wrench pack for screws and exterior grade coating. Includes: 3 Bits. High quality S2 chrome molybdenum steel. Impact double-ended power bits with precision tip. Provides better fit with less stripping. For heavy duty impact, drilling and fastening use. Geometric design provides the shock absorption zone. Forged tips for maximum grip. Double ended Phillips bit set with Magnetic screw hold attachment. DoubleLok technology ensures both ends of bit lock securely in impact drivers and quick-change chucks, enabling use of two tips from one bit for added convenience and extended life. Precision tip geometry delivers superior fitment, reducing stripping and cam-out. Power groove designed for compatibility with Irwin Impact Performance series Magnetic Screw Hold Attachment. Manufactured with Heavy-duty, cold forged high-grade steel to withstand high torque output. Includes: (3) #2PH/#2PH and attachment. Double ended square bit set with Magnetic screw hold attachment. DoubleLok technology ensures both ends of bit lock securely in impact drivers and quick-change chucks, enabling use of two tips from one bit for added convenience and extended life. Precision tip geometry delivers superior fitment, reducing stripping and cam-out. Power groove designed for compatibility with Irwin Impact Performance series Magnetic Screw Hold Attachment. Manufactured with Heavy-duty, cold forged high-grade steel to withstand high torque output. Includes: (3) #2SQ/#2SQ and attachment. Fits: DS312-18V and DS332-AC. Fits DS275-18V and DS300-AC Geometric design provides the shock absorption zone. Proprietary steel and heat treat process for maximum strength and durability. Forged tip allows for a secure grip and maximum contact eliminating stripping or slipping. Made of high-grade S2 tool steel and milled for precise fit. Specifically built for the higher torque requirements of power tools; can be used with drill chuck or quick change chuck adapter in applications such as appliance, automotive, aviation, decking, drywall, electronics, furniture assembly, general construction and HVACR; 1/4" hex shank. Made of high-grade S2 tool steel and milled for precise fit. Specifically built for the higher torque requirements of power tools; can be used with drill chuck or quick change chuck adapter in applications such as appliance, automotive, aviation, decking, drywall, electronics, furniture assembly, general construction and HVACR; 1/4" hex shank. Made of high-grade S2 tool steel and milled for precise fit. Specifically built for the higher torque requirements of power tools; can be used with drill chuck or quick change chuck adapter in applications such as appliance, automotive, aviation, decking, drywall, electronics, furniture assembly, general construction and HVACR; 1/4" hex shank. Made of high-grade S2 tool steel and milled for precise fit. Specifically built for the higher torque requirements of power tools; can be used with drill chuck or quick change chuck adapter in applications such as appliance, automotive, aviation, decking, drywall, electronics, furniture assembly, general construction and HVACR; 1/4" hex shank. High quality S2 chrome molybdenum steel. Made of shock resistant tool steel; 1/4" hex shank. Impact duty driver bits are engineered for extreme durability and long life. Made from proprietary steel and heat treated to control hardness. Geometric design absorbs shock to extend life. Forged tip allows for a secure grip and maximum contact eliminating stripping or slipping. Ideal for heavy duty impact applications and delivers a full system solution for all user's drilling and fastening needs. 25 per package. CNC machined bit tip for precise fit in screw heads for reducing cam-out. Magnetic screw lock sleeve minimizes drops and reduces wobbles. Extended Flex Torq zone transfers optimal torque. Increased durability for long life. Reflex core allows 2" bits flex up to 15 degrees to reduce breakage. Snub nose design for ideal fit. Drive size: 3-1/2". Point size: No 2. Shank size: 1/4". Engineered for maximum durability and long life with impact drivers. Forged, so they fit fasteners more precisely, which reduces stripping and increases the life of the bit. Manufactured with heavy-duty, cold-forged, high grade steel to withstand extremely high torque output. Black oxide finish resists corrosion. One integral unit keeps everything together, no lost parts. Ergonomic contoured finger grip for comfort and more control. Quick and easy changes between drilling and driving, one step loading and multi cutter countersinks. Easy push forward for one-handed release. One integral unit keeps everything together, no lost parts. Ergonomic contoured finger grip for comfort and more control. Quick and easy changes between drilling and driving, one step loading and multi cutter countersinks. Easy push forward for one-handed release. One integral unit keeps everything together, no lost parts. Ergonomic contoured finger grip for comfort and more control. Quick and easy changes between drilling and driving, one step loading and multi cutter countersinks. Easy push forward for one-handed release. Quick and easy accessory changes allow users to finish jobs faster. Hex shank locking system prevents bits from slipping, rapid load holder fits all brands of corded/cordless 3/8" or 1/2" drills. Includes: rapid load holder, 1/8" and 1/4" hex shank drill bits, compact magnetic drive guide, #2 Phillips 2" power bit, #2 square recess 2" power bit, #1 and #2 Phillips 1" insert bits, #1 and #2 square recess 1" insert bits and #8 slotted 1" insert bit. Set contains a total of 30 pieces which includes a variety of drill bit sizes and screwdriving bit tips. Ideal for wood, metal, plastic and masonry projects. Set contains (13) high speed steel drill bits, (16) screwdriving bits and (1) magnetic bit holder. Contained in a handy storage case. Built-in hex collar serves as a stop feature for drilling the perfect hole depth for Tapcon screws and other concrete screws. Drill/drive installation sleeve slides over bit and engages with hex collar to quickly drive hex or Phillips head fasteners. One-piece construction withstands higher torque loads than standard quick change bits. 1/4" quick-change shank is designed to work with impact drivers and reduces slipping in standard drill chucks. Drill and drive system includes: (1) 3/16" bit, (1) 1/4" bit, (1) 5/16" bit and (1) no. 3 bit. Compact magnetic drive guide holds 1'' bit tips. Rapid load quick change accessory system. Use for woodworking, construction, electrical work, remodeling and plumbing. Fits in drill/driver and 7-in-1 screwdrivers. Includes tough case container. CNC machined bit tip for precise fit in screw heads for reducing cam-out. Magnetic Screw Lock sleeve minimizes drops and reduces wobbles. Extended FlexTorq zone transfers optimal torque for durability and a longer life. 2" shank length. Size: No 2. Includes: (4) black oxide drill bits sizes: 1/16", 3/32", 1/8", 1/4", (3) 3.5" ext. length driver bits, (6) 2" power bits (2) P2, (2)P3, R15, R20, (21) 1" insert bit assortment: slotted, phillips, robertson & torx, (1) hex-to-square socket adapter: 1/4"-1/4", (1) magnetic bit holder, (2) magnetic nutsetters: 1/4", 5/16" and carrying case. Used in general purpose cutting when using a high speed or masonry saw. Turbo blades offer a faster cut due to the serrated segment design, allowing less surface to surface contact. Milwaukee Shockwave Impact Duty driver bits are engineered to be more durable and better fitting. The optimized ShockZone geometry is unique for each type to provide up to 30 times longer life and absorbs 3 times more torque. The Precise Fit custom machined tip prevents stripping and reduce wobble, while the Custom Alloy76 Steel and proprietary heat treat process maximizes resistance to wear and shock. Built to deliver extreme durability for the most demanding applications. Includes the most common screwdriving and drill bits. Quick connect adapter fits in most drill chucks for quick bit changing. Quick and easy changes between drilling and driving. 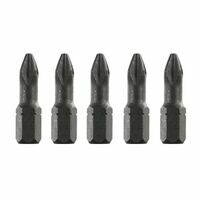 Black oxide split-point drill bits start on contact. Quick change mechanism for easy one-step loading. Easy push forward for one-handed release. Contoured finger grip for easy ergonomic use; 5/16-inch shank for added durability. Includes: (1) drill drive holder, (1) drill drive connector, (1) each #6 and# 8 drill bit with countersink, (3) screwdriver bit tips, (1) # 8 replacement drill bit and (1) heavy-duty case. Includes ratcheting screwdriver, assortment of drill bits, screw driving bits and nut drivers. Folds into a compact carrying case for easy storage and transportation. Hex shank locking system prevents bits from slipping, rapid load holder fits all brands of corded/cordless 3/8" or 1/2" drills. Includes: rapid load holder, (1) one each: 1/4" and 3/8" socket adapters, 1/16", 3/32", 5/32" and 3/16" hex shank drill bits, #1 and #2 Phillips 2" power bit, #8 and #10 slotted 2" power bit, #1 Phillips 1" insert bit, #1 and #2 square recess 1" bit tip, #2 square recess 2" power bit, #8 slotted 1" insert bit tip. (2) each: 1/8" hex shank drill bits and (9) nine each: #2 Phillips 1" insert bit tips. The Tapcon Pro Installation Kit is designed to speed up anchor installation and enhance jobsite productivity. A one-tool system engineered to work with all impact drivers, rotary hammers and hammer drills, the Pro Installation kit can drill and drive. Features recessed hex drivers designed to significantly reduce over-torquing, head snapping and strip outs, allowing PROs to anchor with confidence and efficiency the first time, every time. Compatible with 3/16" and 1/4" diameter Tapcon anchors. Geometric design provides shock absorption to extend life. Made from proprietary steel and heat treated to control hardness. Forged tip allows for secure grip and maximum contact eliminating stripping or slipping. Ideal for heavy duty impact applications. Set includes: (1) Insert 1/2" Socket adapter, (1) 1/4" Magnetic nut driver, (1) Shockwave hex drive bit, (1) 1/8" Drill bit, (1) 3/16" Shockwave hex drive bit, (1) 3/8" Magnetic nut driver, (1) 3/8" Socket adapter, (1) 5/16 Magnetic nut driver, (1) Shockwave compact magnetic bit holder, (1) Hex bit 1" 1/4", (1) Hex bit 1" 1/8", (1) Hex bit 1" 3/16", (1) Hex bit 1" 5/32", (1) Phillips bit 1" P1, (2) Phillips bit 1" P2, (1) Phillips bit 1" P3, (4) Phillips bit 2" P2, (1) Phillips bit 2" P3, (1) Phillips reduced 1" PR2 bit, (1) Slotted 1" no. 10 bit, (1) Slotted 1" no. 8 bit, (1) Slotted 2" no. 10 bit, (1) Square bit 1" SQ1, (2) Square bit 1" SQ2, (1) Square bit 1" SQ3, (1) Square bit 2" SQ2, (1) Square bit 2" SQ3, (1) Torx bit 1" T15, (1) Torx bit 1" T20 and (2) Torx bit 1" T25. Split point tips prevents walking for a wide range of drilling/driving operations. Storage case with rubberized grip and sliding latch. Includes: (7) insert bits, plus a compact screw guide and Phillips double-ended power bits, (3) magnetic nutsetters (1/4"-3/8"), and (8) black oxide drill bits (1/16"-1/4") with 135 degree split point to prevent walking, and case. Includes (7) black oxide drill bits sizes (2) 1/16", 3/32", (2) 1/8", 3/16", 1/4", (3) 3.5" ext. length driver bits, (2) spade bits: 1/2" and 3/4", (9) 2" power bits: slotted, phillips, robertson & torx, (32) 1" insert bit assortment: slotted, phillips, robertson & torx, (2) hex-to-square socket adapter: 1/4"-1/4, 1/4"-3/8", (1) magnetic bit holder with P2, (3) Magnetic nutsetters: 1/4", 5/16"' 3/8", (8) bonus insert bits and carrying case. Specially designed to reduce stripping. Heat treated to resist breakage and wear. Made of shock resistant tool steel for maximum durability. Hardened core for extra strength and reduced breakage. Absorbs 3 times more torque verses impact bits. Precise fit custom machined tip. Holds fastener and bits. Screw installation kit to drill and drive Tapcon screws with only a SDS rotary hammer. This kit contains all you need to install common flat head and hex head concrete screws. Designed specifically for Tapcon screw applications. Built to take impact resistance and transfers energy directly to the bit tip. The rebar chamfers increase tip strength and reduce wear. Exact spot drilling with the centering tip to improve accuracy. The kit includes: (1) 1/4" Hex drive bit, (1) 3/16" x 7" with 1/4" Hex Rotary Hammer drill bit, (1) 5/16" Hex drive bit, (1) 5/32" x 7" with 1/4" Hex Rotary Hammer drill bit, (1) Drive sleeve, (1) No 2 Phillips Driver bit, (1) No 3 Phillips Driver bit and a handy case. Milwaukee Shockwave Impact Duty driver bits are engineered to be more durable and better fitting. The optimized Shock Zone geometry is unique for each tip type to provide up to 30 times longer life and absorb 3 times more torque versus other impact bits. Built to deliver extreme durability for the most demanding applications. Can be used in impact drivers or drill drivers. Custom machined tip prevents stripping and reduces wobble. Custom alloy 76 steel maximizes resistance to wear and shock. 135? split point for precision start; no walking. Titanium coated drill bits for longer life. Set Includes: (1) compact bit holder, (1) 3" bit holder, (1) 6" bit holder; magnetic nut drivers: (1) 1/4", (1) 5/16", (1) 3/8"; socket adapters: (1) 3/8", hex drill bits: (1) 1/16", (1) 1/8", (1) 3/32", (1) 5/32", (1) 3/16", (1) 1/4"; double ended power bits: (1) ph2/sq2, (1) ph2/t25, (1) ph2/sl #10, (1) t20/t25; insert driver bits: (1) ph1, (6) ph2, (1) pr2, (2) ph3, (1) sq1, (3) sq 2, (1) sq3, (1) 110, (1) t15, (2) t20, (3) t25, (1) t30, (1) sl #6, (1) sl #10, (1) hex 3/16", (1) hex 1/4"; 2" power bits: (1) ph1, (4) ph2, (2) ph3, (1) sq1, (3) sq2, (1) sq3, (2) t20, (2) t25, (1) t30 and (1) sl #10. Premium grade S2 tool steel. Durable composition equals longer bit life. Corrosion resistant, black oxide coating provides lubricity and resists corrosion of the bit. Thicker web provides greater strength and longer life. Fast, accurate drilling. 135 degree split point tip starts on contacts to prevent walking, while the parabolic flute clears chips fast. 95 piece set includes: (1) 1/16" Thunderbolt black oxide drill bit, (1) 1/4" Magnetic nut driver, (1) 1/4" Thunderbolt black oxide drill bit (1) 1/8" Thunderbolt black oxide drill bit, (1) 3/16" Thunderbolt black oxide drill bit, (1) 3/32" Thunderbolt black oxide drill bit, (1) 5/16" Magnetic nut driver, (1) 5/32" Thunderbolt black oxide drill bit, (1) 5/64" Thunderbolt black oxide drill bit, (1) 7/64" Thunderbolt black oxide drill bit, (2) Hex bit 1" 1/16", (2) Hex bit 1" 1/4", (2) Hex bit 1" 3/16", (2) Hex bit 1" 5/32", (2) Hex bit 1" 9/64", (2) Hex bit 1" 1/8", (2) Hex bit 1" 3/32, (2) Hex bit 1" 5/64", (2) Hex bit 1" 7/64", (1) Magnetic drive guide, (3) Phillips bit 1" P1, (10) Phillips bit 1" P2, (4) Phillips bit 1" P3, (3) Phillips bit 1" PR2, (1) Phillips bit 2" P2, (1) Pozidrive bit 1" PZ1, (1) Pozidrive bit 1" PZ3, (2) Slotted bit 1" SL 1/4", (2) Slotted bit 1" SL 1/8", (2) Slotted bit 1" SL 3/16", (2) SL 7/64", (2) Slotted bit 1" SL 9/32", (1) Slotted bit 2" SL 3/16, (3) Square bit 1" SQ1, (8) Square bit 1" SQ2, (3) Square bit 1" SQ3, (1) Square bit 2" SQ2, (2) Torx bit 1" T10, (2) Torx bit 1" T15, (3) Torx bit 1" T20, (3) Torx bit 1" T27, (2) Torx bit 1" T30, (2) Torx bit 1" T40, (2) Torx bit 1" T9, (1) Torx bit 2" T20, (1) Torx bit 2" T25. Specially designed to reduce stripping. Heat treated to resist breakage and wear. Made of shock resistant tool steel for maximum durability. Hardened core for extra strength and reduced breakage. Specially designed to reduce stripping. Heat treated to resist breakage and wear. Made of shock resistant tool steel for maximum durability. Hardened core for extra strength and reduced breakage. Milwaukee Shockwave Impact Duty driver bits are engineered to be more durable and better fitting. The optimized ShockZone geometry is unique for each type to provide up to 10 times longer life and absorbs 3 times more torque. The Precise Fit custom machined tip prevents stripping and reduce wobble, while the Custom Alloy76 Steel and proprietary heat treat process maximizes resistance to wear and shock. Built to deliver extreme durability for the most demanding applications. Kit Includes nutsetters and black oxide drill bits up to 3/8", (1) Magnetic dish, (1) small empty removable storage box, (1) bit holder with drive guide, (1) normal bit holder, (3) nut drivers (1/4", 5/16", 3/8"), (1) 1/2" socket adapter, (1) 1/4" socket adapter, (17) drill bits in 12 sizes (1/16" through 3/8"), (4) long bits of 4 types (P1, P2, SL8, SQ2), (6) medium bits of 6 types (P1, P2, SQ1, SQ2, T20, T25), (45) small bits of 14 types (2x SQ3, 5x SQ2, 2x SQ1, 3x P3, 6x P2, 2x P1, T40, T30, 5x T25, 5x T20, 2x T15, 3x SL10, 3x SL8, 3x SL6 and a hard plastic storage and carrying case to keep things organized and provide maximum durability for the contents. Milwaukee Shockwave Impact Duty driver bits are engineered to be more durable and better fitting. The optimized Shock Zone geometry is unique for each tip type to provide up to 30 times longer life and absorb 3 times more torque versus other impact bits. Absorbs peak torque and prevents breaking. Built to deliver extreme durability for the most demanding applications. Can be used in impact drivers or drill drivers. Custom machined tip prevents stripping and reduces wobble. Custom alloy 76 steel maximizes resistance to wear and shock. 135? split point for precision start; no walking. Titanium coated drill bits for longer life. Set Includes: (1) compact bit holder, (1) 6" bit holder; insert magnetic nut drivers: (1) 1/4", (1) 5/16", (1) 3/8"; insert socket adapters: (1) 3/8"; 3/8" drive thin wall deep impact sockets: (1) 1/2", (1) 9/16"; hex drill bits: (1) 1/16", (1) 3/32", (1) 1/8", (1) 3/16", (1) 1/4", (1) 3/8": double ended power bits: (1) ph2/sq2, (1) t20/t25; insert driver bits: (2) ph1, (8) ph2, (2) pr2, (3) ph3, (1) sq1, (4) sq2, (2) sq3, (1) t10, (2) t15, (3) t20, (5) t25, (1) t27, (1) t30, (1) sl #8, (1) sl #10, (1) hex 3/16", (1) hex 1/4", 2" power bits: (1) ph1, (3) ph2, (1) ph3, (1) sq1, (2) sq2, (1) sq3, (1) t15, (2) t20, (2) t25, (1) t30, (1) sl #10; 3-1/2" power bits: (1) ph2, (1) t25; 6" power bits: (1) ph2 and (1) sq2. Milwaukee Shockwave Impact duty bits are engineered to be very durable. The optimized Shockzone geometry is unique for each tip to provide longer life and absorb more torque. The precise fit custom machined tip prevents stripping and reduces wobble, while the custom Alloy76 steel proprietary heat treat process maximizes resistance to wear and shock. Shank is 1/4" hex. Shank is 1/4" hex. Specially designed to reduce stripping. Heat treated to resist breakage and wear. Made of shock resistant tool steel for maximum durability. Hardened core for extra strength and reduced breakage. High quality S2 chrome molybdenum steel; 1/4" hex shank. Automatically sets screws to proper depth in drywall. Provides a tight fit in the fastener recess in applications such as cabinetry, decking, drywall; 1/4" hex shank. Made of high-grade S2 steel and are milled for a precise fit; 1/4" hex shank. Made of high-grade S2 steel and milled for a precise fit; 1/4" hex shank. High quality S2 chrome molybdenum steel. High quality S2 chrome molybdenum steel; 1/4" hex shank. Shank is 1/4" hex. Shank is 1/4" hex. High quality S2 chrome molybdenum steel. High quality S2 chrome molybdenum steel. High quality S2 molybdenum steel. Fits Robertson screws; 1/4" hex shank. Contractor quality. Machined from high quality chrome vanadium molybdenum tool steel; 1/4" hex shank. High quality S2 chrome molybdenum steel. High quality S2 chrome molybdenum steel. Made of high-grade S2 steel and are milled for a precise fit; 1/4" hex shank. Provides a tight fit in the fastener recess in applications such as cabinetry, decking, drywall; 1/4" hex shank. For drills and cordless screwdrivers; 1/4" hex Shank Contractor quality. Machined from high quality chrome vanadium molybdenum tool steel; 1/4" hex shank. Combines two power bits in one tool and used with 3-jaw chucks. Not for use in bit holders or quick change chuck adapters; 1/4" hex shank. Packed 300 pieces per display canister; 1/4" hex shank. Great impulse item. Packed 300 pcs per display canister; 1/4" hex shank, chrome/vanadium. Used in high torque applications, automotive and computer; 1/4" hex shank.